At the recent Water Rally in Sacramento, more than 1000 farmers and other stakeholders were protesting the California Water Resources Control Board, which is proposing a water grab of 40 percent of the water from the Stanislaus, Tuolumne, and Merced Rivers to increase flows for salmon. According to Adam Gray —21st District State Assemblyman, representing Stanislaus and Merced—counties said that large losses would occur in jobs and profits if the water grab is implemented. Gray said that this is not about the environment versus business, or fish versus people. This is about the whole community, the schools, the ag economy and a lot of job losses for the people he represents. “It’s dishonest; the Water Board is not admitting that there’s going to be an impact in the affected areas. They say farmers are going to offset the water losses by pumping more. Well, you and I both know with the implementation of SGMA and all of the other challenges, that’s not a reality,” he said. Gray said the farming community will stand up for the investments made to secure water. A new study entitled, “The Implications of Agricultural Water for the Central Valley,” by Dr. Michael Shires of Pepperdine University, shows the economic implications of water in the Central Valley, and the potential outcome of continued water reductions in agriculture. Agriculture is a major part of California’s economy, and this study illustrates both the outcome of increased water allocation and the potential growth that would come with it, or what could happen to the economy if this decline continues. This continued loss of water would result in a huge increase in the unemployment rate. Fresno would require 6.2 billion in solar farm investment annually to replace agricultural jobs that would be lost. Johnny Amaral is the Deputy General Manager of External Affairs of the Westlands Water District. We spoke with him about Dr. Shire’s study, and what it means for the Central Valley. Shires is an economics professor at Pepperdine. A lot of false information circulates about water use and agriculture. Most of this misinformation leads to a general negative opinion about agriculture, especially when it comes to water use. “We’re constantly dealing with misinformation, deliberate misinformation about water policy, about agriculture,” Amaral said. “You hear all the buzz words all the time about ag uses 80% of the water, which is not true. We’re constantly dealing with misinformation, so we thought it would make sense to have a document put together, a study done to show just what agriculture means to the Central Valley and to the state,” Amaral said. Mario Santoyo, executive director, San Joaquin Valley Water Infrastructure Authority (Joint Powers of Authority), described the major and historic event held last week at the Friant Dam regarding the Temperance Flat Dam and California’s future water supply. 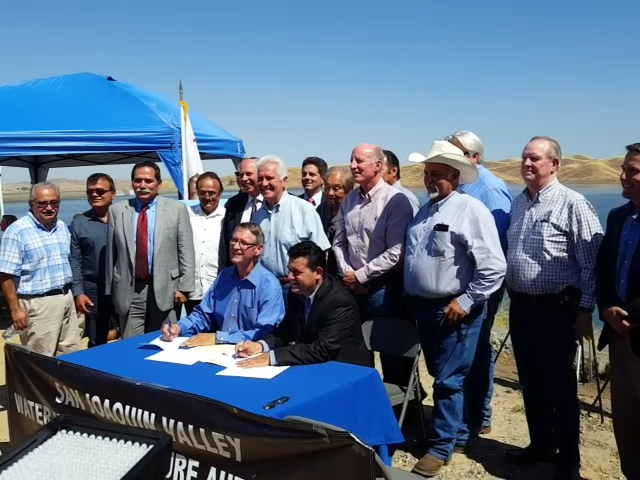 At Friant Dam, a Memorandum of Understanding was signed between the Department of the Interior, Bureau of Reclamation and Joint Powers Authority for the Temperance Flat Dam. Santoyo hopes to receive $1B in funding for the Temperance Flat Dam, although “it is going to cost somewhere around $2.8B. The maximum you could ask from the state is $1.4B. We don’t expect to be getting that because there is a lot of competition and there’s not enough dollars to go around. We’re hoping to shoot for somewhere around $1 billion,” he stated. 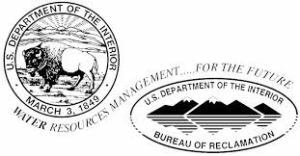 “In parallel with our efforts with the state,” Santoyo explained, “we’re working on the federal side with our senators and our congress members to obtain what they call a federal construction authorization—which allows the federal government to move ahead with this project. Then we work on appropriations,” he said. Santoyo also noted preliminary feasibility studies are underway. Those already completed triggered the final feasibility report, “which is going through a final upper management review before being released to the public. I think we are all pretty confident it will come out in a very positive manner. I would expect that in the next sixty days,” he said. The expected completion of the project varies. Santoyo estimated physical completion within five years,” but it has to go through design and environmental paperwork, plus legal challenges could cause setbacks as well. By the time you’re good to go, you’ll end up having this project built in probably under 15 years,” he said. Nevertheless, Santoyo said the benefits of the Temperance Flat Dam project is to creates an economic boom and an increase in available jobs. “You’re going to be spending about $3B here for materials, labor, and everything that goes into it. It will be an economic boom; and once it’s built, we get more water reliability, creating a better situation for the farmers, and that creates employment. I wouldn’t look at waiting 15 years, it starts as soon as we start building,” he said. “The fact is, without this project, we will not be able to meet the ground water sustainability laws that exist because this water will be necessary to move underground to all these regions,” he said. “Right now, as it stands, San Joaquin River Settlement has taken away the Class II water that used by the Friant contractors to replenish the groundwater. Unless we have a means of replacing it, and that would be through Temperance Flat, we’re going to encounter very serious problems,” Santoyo noted. “There are a lot of conversations about the San Andreas Fault rumbling. If we had an earthquake, we could have a seismic event in the Delta,” Santoyo said. “What differentiates this project from all the other projects is that we could take Temperance Flat water and go north via the San Joaquin River to the Delta, or south via the Friant-Kern canal, across the valley canal to the California aqueduct then subsequently down to southern California,” he said. 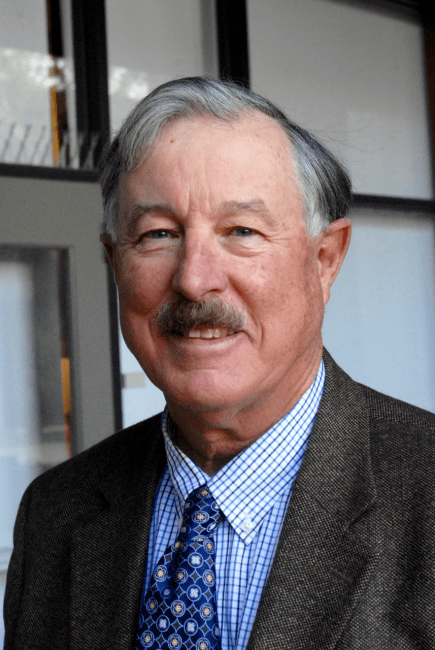 The California Irrigation Institute recognized Dr. David F. Zoldoske as its Person of the Year at its 53rd annual conference on Feb. 2-3 in Sacramento. Zoldoske, director for the Center for Irrigation Technology at Fresno State, is the 36th recipient of the award sponsored by the state’s oldest independent forum on irrigation and water. Zoldoske is the third recipient with Fresno State ties. Winston Strong, former plant science and mechanized agriculture professor was recognized in 1985 for his pioneering work in sprinkler testing, and former Center for Irrigation Technology director Kenneth Solomon was honored in 2004. The annual conference brings together water experts, government agency representatives, water district managers, innovative farmers, urban water managers and commercial interests to focus on pressing water issues, explore innovative solutions, and discuss results of research and practical experience in the field. Zoldoske was recognized with a similar national award in November 2013 as the Irrigation Association’s Person of the Year. Fresno State has been involved in irrigation testing and research for more than 60 years, and Zoldoske has played a key role for four decades. He started his irrigation career as a graduate student research assistant before beginning work as a full-time research technician in 1983. In 1994, he was named director of the center that is internationally-recognized as an independent testing laboratory, applied research facility and educational resource.